Format et nombre de pages : 13,5 x 22 cm - 200 p.
How is Chaucer’s Canterbury Tales best read ? Should we follow Kittredge in treating the work as drama, imagining the tales as theatrical scripts defining the characters to whom they are attributed ? Or should we follow Muscatine in emphasizing their poetry, studying their intertextuality and admiring the stylistic innovations that Chaucer employs in adapting his sources ? Or should the tales be read as independent narratives framed by a meta-textual Prologue and links ? Some of the most renowned medievalists from Europe and America review these critical stances, bringing out their differences and their points of contact. 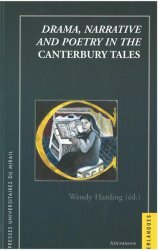 Part One of the volume addresses these aesthetic questions in terms of the Canterbury Tales in general. The articles in Part Two explore some of the best known tales.